Expertly mixed with plant fiber, they combine to form a purely natural product designed as part of a calorie controlled diet for healthy weight loss. The main purpose of effective weight loss supplements is to provide healthy support and nutrition for a calorie controlled programme. 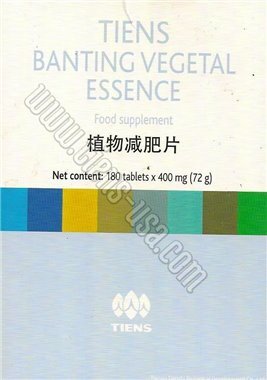 Banting Vegetal Essence Tablets are made in accordance with the principles of traditional Chinese medicine (TCM). 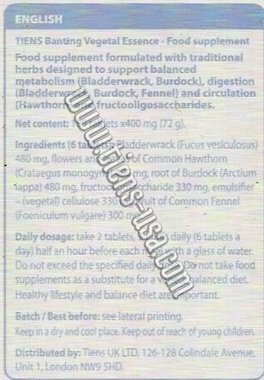 Banting Vegetal Essence Tablets are not a meal replacement - for best results take 2 tablets three times a day immediately before meals with water. Toxic states (food poisoning, job with toxic materials, improper ecologicall housing, etc.). Children under 12 use with caution (under medical supervision). Take 2 tablets three times a day before meals with water. Children from 12 years: 2-3 times 1 tablet daily. Adults: 2-3 times 2 tablets daily. Take always before eating, chew well, and drink half a glass of lukewarm water.